The sternoclavicular (SC) joint has an important function: it is the only bony connection linking the bones of the upper limbs to the main part of the skeleton. 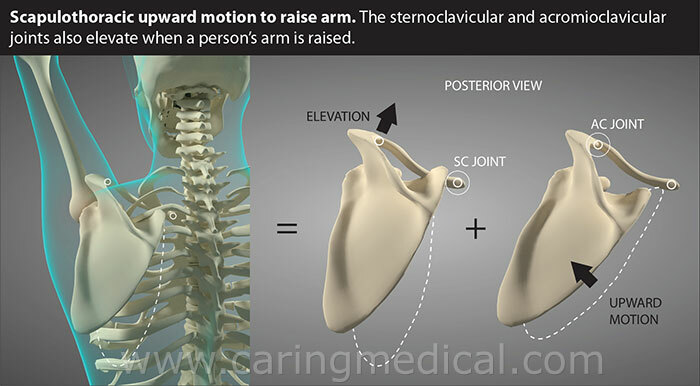 The SC joint provides stability to the front of the chest and shoulder. It connects your sternum to your clavicle, specifically at the manubrium (broad upper part) of the sternum and at the proximal end of the clavicle. The sternum, also known as the breastbone, is a long flat bone located in the center of the chest. The clavicle, also known as the collarbone, is the only long bone in the body that lies horizontally. Articular cartilage covers the ends of the bones that make up the SC joint, which is a white, smooth material that allows the bones of a joint to rub together without much friction. Ligaments attach bone to bone and allow for proper movement. The sternoclavicular ligament, which has an anterior and posterior aspect, connects the clavicle to the sternum. Other ligaments cross the SC joint to give it more stability. The costoclavicular ligament connects the clavicle to the first rib just below. The interclavicular passes over the top of the sternum and connects the two clavicles. 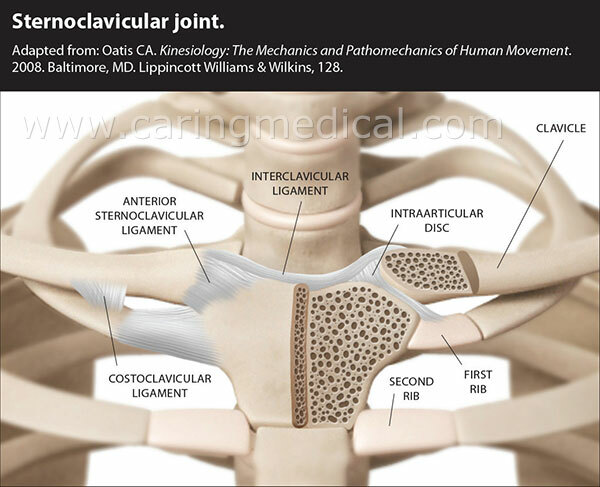 There are no muscles that act directly on the SC Joint. Sternoclavicular joint injuries can occur with a direct blow to the shoulder or chest, like in a motor vehicle accident or during a contact sport, or falling onto an outstretched hand. An injury can also occur from weightlifting, especially if using heavy weights with incorrect or compromised form. Injuries can range from mild to severe. The patient will usually complain of pain at and around the top of the chest just below the neck. Pain may increase when moving the arm across the body, overhead arm activities, pushing or pulling activities or lying face down on the chest. Some patients will feel like the joint is unstable and report clicking or popping as well. Comprehensive Prolotherapy to the SC joint can strengthen the ligaments and allow proper healing of the joint. Because the SC joint is the only bony connection linking the bones of the arms/shoulders to the main part of the skeleton, it may require the use of a stronger proliferant and more frequent visits. Bracing with a figure-eight strap wraps in between treatments can assist with healing. For long-term resolution of SC joint injuries, the ligaments need to be strengthened, which can happen with a short series of Prolotherapy injection treatments, or utilizing PRP as the primary proliferant in some situations. Our providers would be happy to review your case and see if you qualify for our Prolotherapy treatment programs. These are great non-surgical options for athletes and physical laborers who cannot afford time off for surgery and want to avoid surgical risks altogether. Contact us to tell us more about your case and let’s get working on resolving your SC joint injury for good! Warth RJ, Lee JR, Campbell KJ, Millette PJ. Arthroscopic sternoclavicular joint resection arthroplasty: a technical note and illustrated case report. Arthrosc Tech. 2014 Feb;3(1): e165-e173.